Looking for a not too demanding, yet adrenaline-filled fun sea experience for you and your friends? Tube riding is an excellent choice! It is sure to raise your adrenaline, but luckily does not require significant skill or hard effort, as the stable, inflatable vessel to ride on is towable by a speedy watercraft. So hold on tight and get ready to bounce off the waves as the ride skips across the waters surface! Interested in giving it a try? 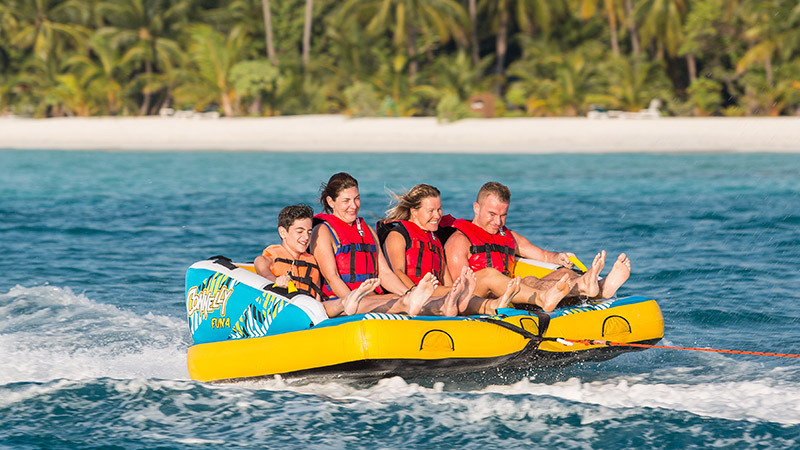 Please drop us an email at veligandu@oceangroup.mv to book your water activities in the Maldives or visit our Ocean Water Sports Centre to request your fun tube ride splash now!